In October, FFA members embarked on a trip to Indianapolis for the annual FFA National Convention. Last week from October 24th through the 27th, eight of our very own Cannon Falls FFA members attended the 91st National FFA Convention and Expo. The National FFA Convention is held every year in late October drawing in over 67,000 FFA members that are eager to learn, compete, and most importantly, make memories. Each year the convention consists of members ready to embark on the short four day journey that is the National Convention from all across the country and US territories, ranging from Alaska to the Virgin Islands, and from the states of Maine to Hawaii. At the Convention there are numerous things that one can do. Some of these include touring the schools that come to represent agriculture in their states, growing as a leader through the workshops and general sessions, and touring the downtown and local agribusiness companies. This year on the 14 hour long coach bus ride to Indianapolis, the Cannon Falls FFA stopped at Wetherby Cranberry Farm. It was here that members learned about the mass production of cranberries and how they are harvested. Did you know that Wisconsin is the number one producer of cranberries in the world and they produce over 57% of the world’s total cranberries? Members also learned about how the crop is kept over winter and made into goods. FFA members also got to try their hand at numerous opportunities at the convention. It was at the convention that the members got to see a Garth Brooks concert, a World’s Toughest Rodeo, and a presidential address. Throughout the convention there were many things that the FFA members learned. Jeremy Soine, a Cannon Falls FFA member, stated, “ The 91st National FFA convention may have been my 4th convention, but it was definitely one for the books. It was here that I got to learn more about how I can leave a lasting impact on others, live with purpose, and meet new people. There were so many amazing opportunities where I was able to put what I have learned into effect and I am truly thankful for such an amazing experience.” Just like Jeremy, the Cannon Falls FFA attendees were able to have an amazing time at the convention and meet new people. 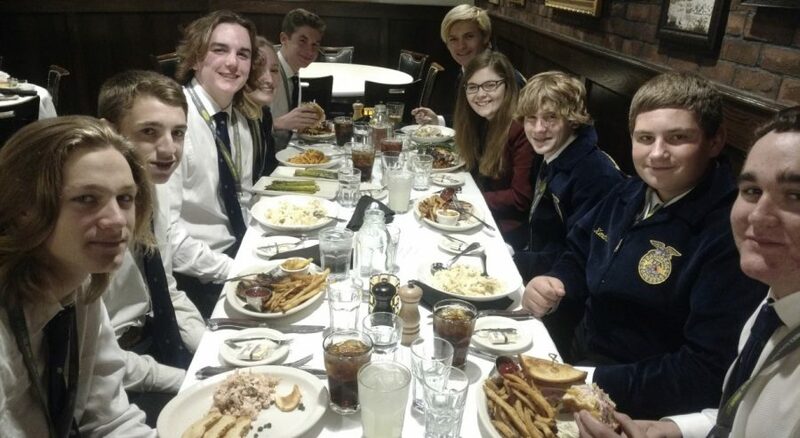 During their travels at the Indianapolis FFA convention, members also learned more about how politics and agriculture intertwined. There were 9 general sessions at the convention, with every one of them having their own message that left the audience inspired and ready to make their mark on their community. It was during the 9th general session that the FFA members who had made it into the stadium were able to hear a message from the President of the United States of America, Donald J. Trump. This is nothing new to the National FFA convention, but is the first time in over 30 years that a sitting president had visited the convention. It is a long running tradition that dates back years where the National FFA Organization will invite the sitting president to speak at the last general session, no matter their political affiliation. With members experiencing Agribusiness around the country, learning more about scholarships and schooling within agriculture, and hearing a presidential address, the 91st National FFA Convention “was definitely one for the books” and left all of it’s members wanting more.